The bicycle revolutionised movement through the landscape for hundreds of avant-garde Queenslanders during the closing years of the nineteenth century. Until this time, before the era of car ownership, the horse had provided the only means of private transportation faster than walking. The railway, bus, tram, coach and steamer were the available forms of public transport. Cycling now changed the landscape and the perception of landscape in significant ways. Cycling, described as the most exhilarating of outdoor pastimes, demanded a greater intimacy and understanding of terrain, weather, landscape and infrastructure. New considerations were the state of the roads, the presence of sand, gravel and water, the placement of directional signage called finger posts, river and overhead bridges, ferry crossings and rail gates, and the consequent reliance on ferry and railway gate staff. Also to be considered were the steepness of hills and the length of flats and even the presence and density of traffic. Cycling created greater exposure to the seasons and reliance on the elements such as wind, temperature and moonlight. Cycling changed landscapes and it changed maps. It created a need for new maps designed especially for the cyclist – simpler, foldable maps that displayed the character of roads and the landscape and showed the presence of amenities. Cyclists could travel further than pedestrains and surrounding districts could be more easily accessed and explored. Hotels as destinations provided ‘watering holes’ for the cyclist, a place to rest and consume a meal before returning. 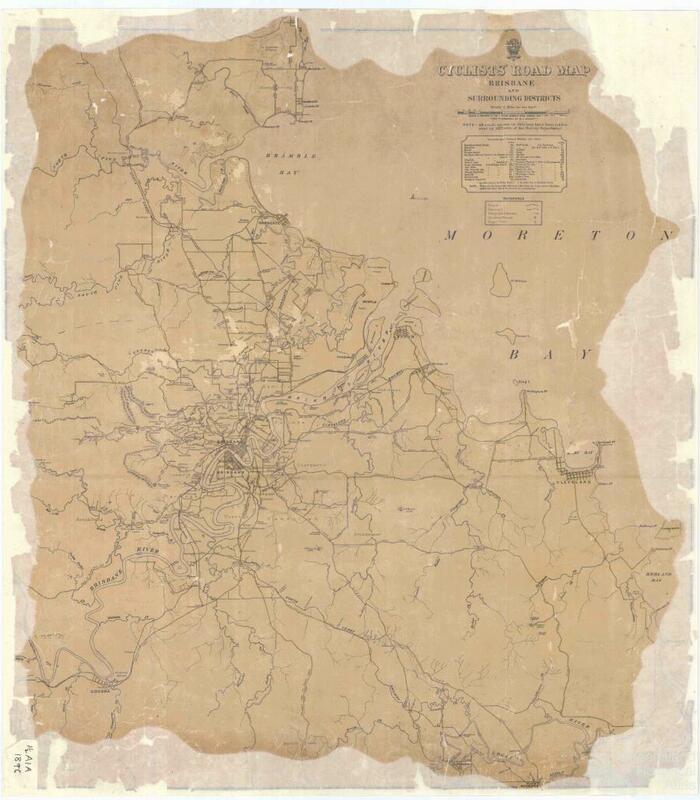 These new maps began to appear at the turn of the nineteenth century in many of the Australian colonies and 1896 saw the publication of at least three major cycling maps – of Victoria (published in March), Brisbane and Surrounding Districts (October) and Tasmania (November). At least two cycling maps of New South Wales were published in this era, one in 1898, and another in 1902. The Cyclists’ Road Map of Brisbane and Surrounding Districts was produced by the Surveyor General’s Department in two sheets and priced at one shilling per sheet. It stated, ‘All roads shown on this map have been ridden over by Officers of the Survey Department.' 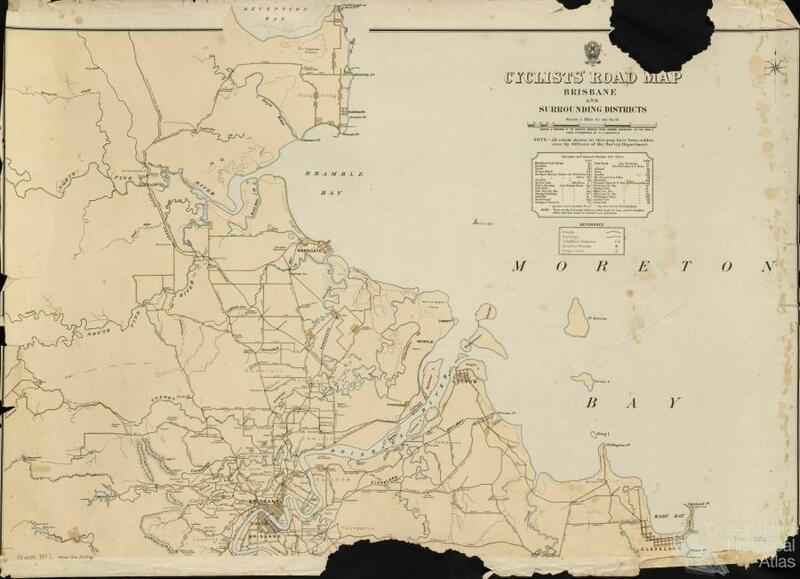 The map key indicates ‘Roads, Railways, Telegraph Stations, Omnibus Stands and Finger Posts.’ It is a legible map, similar in style to the 1902 New South Wales map where, according to the Sydney Morning Herald 18 September 1902, the ‘tourist is not bothered by the distracting mass of rivers, mountains, and railways which in many maps obscure the all-important lines of highway.’ These new cycling maps as well as being less cluttered were subjective – they contained comments, speculation and personal observations. Significantly the map does not cover the whole state, but is limited to the capital and surrounds – north to Deception Bay, south to Beenleigh and west to Gold Creek and the Bremer River. The furthest distance measured is to Scarborough, 29¼ miles. Along the way are noted some fair roads, good roads and numerous features of the landscape including a ‘very fine view’ at Bald Hills, and churches, cemeteries, racecourse, hotels, schools, factories, vineyards and beaches. Ferry times add to the trips, and many areas contain useful annotations such as 'steep hill', the location of railway gates and overhead bridges. Towards the scenic mountains are frequent steep hills, annotated with advice such as ‘steep – may be walked up’, 'bush tracks only', and 'fine view'. Warnings dot the map, and include ‘impracticable – except on foot’, ‘dangerous’, ‘impracticable for cyclists’, ‘scrub road’, ‘not recommended’, ‘bad road’, ‘covered at high water’, and so on. Cycling maps were also published in response to the period when the bicycle and cycling underwent a complete transformation. The safety bicycle replaced the more dangerous penny farthing (seen on Brisbane streets from the late 1860s), and patents were taken out on pneumatic or air tyres (previously solid rubber), allowing for a more comfortable ride, and the changeable gear, enabling a rider to gear differently to a hill or on the level. Clubs were established in such places as Brisbane, Townsville, Rockhampton, Bundaberg, Ipswich and Charters Towers. Imported racers and roadsters were stocked at new cycling stores and warehouses in the city and major towns. Alfred Shaw and Co. in Brisbane stocked at least 100 bicycles in their warehouse, as did A. Reed’s bicycle shop in Edward Street. Cyclists utilised a range of cinder tracks at Toowong, Breakfast Creek, the Exhibition Ground, Albert Sports Ground and the Aquarium. By 1892 ponies were replaced by bicycles at Warwick Post Office for message boys. In 1898 (the first year bicycles were recorded) the Queensland police had 39 bicycles. The average adult’s bicycle cost about £30, could be purchased on time payment and often included lessons. As adults had not grown up familiar with cycling, it was necessary for them to learn the skills by instruction. In 1896 it was reported that at least 60 men and women were learning to cycle in Brisbane at the Austral Cycle Agency. Women were reportedly out cycling at about 5.30 on weekday afternoons, returning home around nightfall, no doubt encouraged by reports that Lady Lamington the wife of the new governor was a ‘cycliste’. But it was touring and road races rather than track cycling that brought riders closest to their landscape and necessitated the need for detailed maps. For those racing to Wynnum in 1886, the prize was a 16-perch allotment in the east Wynnum Estate. the sides of Elizabeth-street at the back of the Post Office were lined with spectators. The interest did not stop here, for all along Wickham-street, and even as far as Albion, people who watched for the passing of the competitors were gathered together at different corners. The 40 riders released on a handicap start rode to the Hotel Albion and then over the hills at the back of the Albion. Some were delayed at the gates of the Eagle Farm railway crossing, but the gates of the Nundah railway crossing were held open for the riders who then cycled on towards the Nundah Hill, over the Red Hill, and entered the part of the road known as White Flats on which the back riders could see the front riders. This was, however, a sandy part of the road. They rode on to the straight, level piece of road leading to the first hill in Sandgate, and onto the finish at the Sandgate Post Office. The fastest rider completed the course in 55 mins 30 sec. Wind brought dust hazards on the road and in Sandgate riders faced a strong head wind and wet sand. The road from the start to the Hamilton Hotel is a very fair one for fast riding, but after leaving the later place for over half a mile to the corner of the Nudgee road it is very rough. From here right to the Toombul railway gate it is fine, though loose in places. 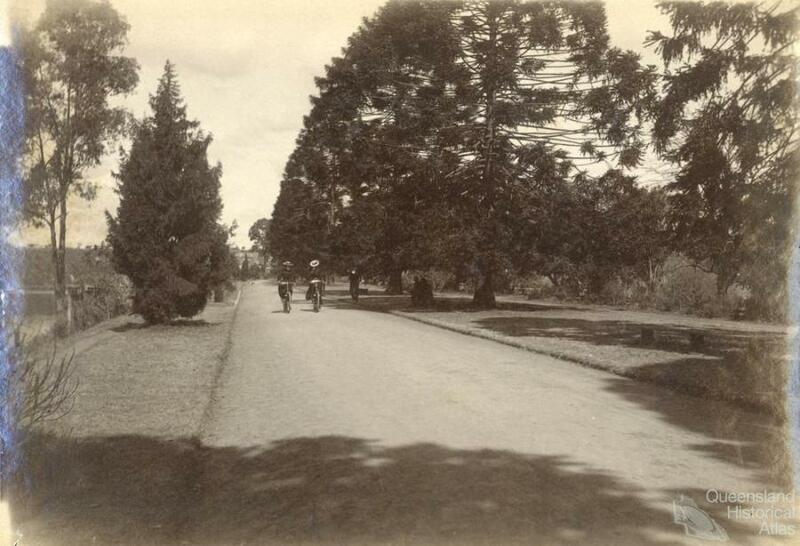 After the Sandgate-road is struck, near Virginia railway station, the road is fair until within a mile of the Cabbage-tree railway station at the foot of the College Hill, where it is loose and sandy, with plenty of ruts. However, should a shower of rain fall at any time before the race it would put the roads in grand order. With the publication of the 1896 Cycling Map, this type of personal knowledge was imparted through the map itself. Safety bicyclists also raced south from the Normal School corner to Rocklea by way of Toowong-road and the Indooroopilly Railway Bridge. Traffic had become a problem for racing cyclists. In a race to the Aquarium at Queensport along the Lytton Road, cyclists had to avoid the increased traffic caused by defence volunteers returning from Lytton. The start of road races was changed from the Museum to Darragh’s Hotel on Kangaroo Point so as to avoid the traffic. after riding for an hour and a half they arrived at the South Pine, where they stopped for breakfast. This was followed by an hour’s spell, and at half-past 9 they reluctantly resumed their saddles and lazily proceeded on their way. After passing Hayes’s Inlet the really bad road commenced ... the last part of the road into the township was found fatiguing in the extreme, and it was not until twenty minutes to 12 that the Western Hotel appeared in sight ... At 4 o’clock the riders ... started from the Woody Point jetty ... near South Pine they rode though heavy showers. The Bald Hills were reached ... the town was not reached till half past 8. ... as a pleasure trip [it] is very creditable. Sundays were often used for touring to Sandgate for lunch and return, despite some antagonism in the early 1880s about riding on Sundays, especially when the ride went past churches. Women were encouraged to ride in a ‘healthful way’, meaning that restrictive clothing such as corsets and ankle boots should be replaced by what was termed ‘rational dress’. Club cycling clothes for men were also adopted. The Brisbane Bicycle Club uniform consisted of navy blue jacket and knickerbockers, dark blue hose and polo caps to match, and a straw hat with club badge for day riding, although some questioned the suitability of dark blue serge for semi-tropical summer riding. Cyclists took moonlight rides to Eagle Farm Flats, returning to town after spending an hour in the ‘music-room’ of the new Hamilton Hotel. At night bicycle lamps were lit. Day trips south to Beenleigh started at South Brisbane Tramway, utilising the Loganholme Ferry to Yatala Bridge for lunch at Palms Hotel, then return. Pleasure trips to Ipswich and return (a distance of about 55 miles) were less popular owing to the very bad condition of the road. The newspaper issued general cautions to cyclists crossing bridges including the Victoria Bridge and ‘that remarkable structure over Hayes’s Inlet and one or two others in out of the way corners’. Cyclists pitted themselves against other forms of transportation, racing trains and boasting that they could beat the steamer to Redcliffe. The roads from Brisbane to Caboolture are … good; from Caboolture to Landsborough, bad; Landsborough to Mooloolah, good when dry; Mooloolah to Palmwoods, very bad and hilly; Palmwoods to Yandina, fair; Yandina to Cooran, fair; Cooran to Gympie, good; Gympie to Maryborough, very good; Maryborough to Howard, good when dry. This intimacy is lost once the car comes to dominate the landscape of cities. Less than 20 years after the cycling map was published, Kenneth Craigie published his Road Map of 100 Miles round Brisbane for Motorists, Cyclists, Travellers etc. Gone were the intimate details and personal knowledge of the landscape, as the distances and the size of the city increased.